Four French antique purse designs. 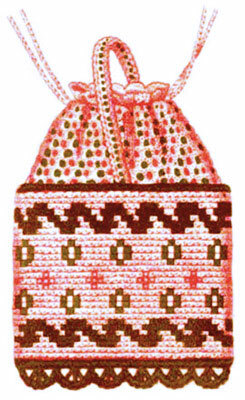 Exquisite crochet purses were featured in an 1855 issue of Godey’s Lady’s Book and Magazine. The hand-colored plate showcased the “Latest Paris Fashions.” Highlighted are wonderful illustrations that will aid the antique purse collector in identifying a treasured piece. This tasteful little antique purse is made quite small, being only intended for gold dollars. The rings in the center are formed by crocheting over steel rings, and then filling up the center with a large gold bead. 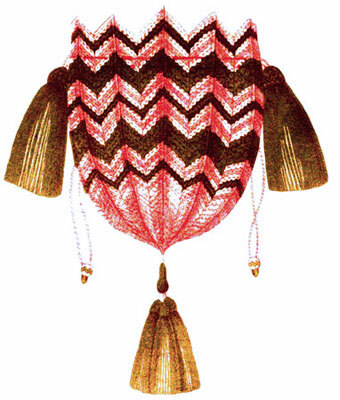 It is finished with a handsome gilt clasp, and the purse is formed of cherry and white silk, and gold thread. This basket-shaped antique purse is quite novel. The lower part is made by crocheting over thick gold cord with gold thread, and cherry and white silk. The upper part of the purse is open crochet and the handle is tight crochet over a cord. 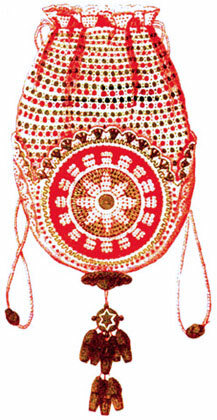 This antique purse is formed of four medallions worked in open and tight crochet. They are then joined together and the rest of the purse worked in open crochet. A rich tassel finishes it. This tulip-shaped antique purse is made of cherry, white, and gold, and finished with heavy gold tassels. In February 1885, Fanny S. Reid received a lovely gift of a fancy leather sewing purse. Download free instructions to make one of these antique purses so you can sparkle in style.